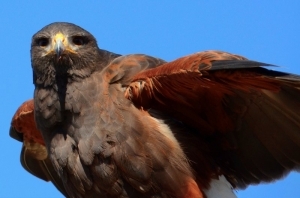 South Texas is where the Lone Star State’s birding is at its best. The Coastal Bend is home to overwintering Whooping Cranes, one of the world’s rarest birds. The Lower Rio Grande Valley area is a major migration corridor at the convergence of two flyways and an excellent location for tropical species extending their range beyond Mexico. Spend some time getting to know diverse landscapes from Rockport to Rio Grande City and from McAllen to South Padre Island. Each day will be filled at a variety of birding hotspots in search of Whooping Cranes, parrots, chachalacas, raptors, and more. With more than 500 species recorded in the region, both expert and novice birders will find an array of avian delights. Escape Colorado’s winter weather and join Chip Clouse from Front Range Birding Company for an unforgettable birding adventure in South Texas. Day 1 (Sat, Jan 19) ~ Afternoon arrival to Corpus Christi International Airport (CRP). Chip Clouse, our guide, will meet the group at the airport upon arrival. Late afternoon birding en route to Rockport. Day 2 (Sun, Jan 20) ~ Our first full day in South Texas begins with a guided birding tour in search of overwintering Whooping Cranes. 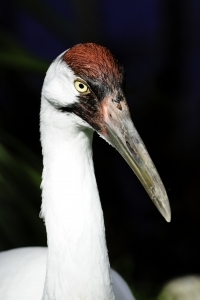 The Whooping Crane is the rarest crane species and one of the rarest birds in the world. In addition to cranes, expect to spot 30 to 60 different species during the 3.5-hr coastal birding boat tour. After lunch, continue to Rio Grande City with birding en route. Evening arrival to Rio Grande City. Day 3 (Mon, Jan 21) ~ Full day of birding up river hotspots including Falcon State Park, Salineño, and Chapeño. Evening arrival to McAllen where we’ll spend the next two nights. One of our evenings in McAllen will include a stop at the local Green Parakeet roost. Falcon Lake State Park Area ~ This region offers some of the best sites along the Rio Grande for kingfishers (Ringed and Green), orioles (Altamira, Hooded and Audubon’s), Gray Hawk, Red-crowned Pigeon and the rare wild Muscovy Duck. Day 4 (Tues, Jan 22) ~ Full day of birding including Bentsen – Rio Grande State Park, Santa Ana National Wildlife Refuge, and local McAllen hotspots. 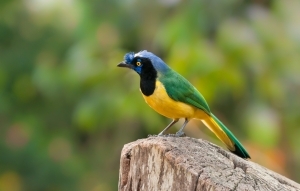 Bentsen – Rio Grande Valley ~ Birders across the nation know Bentsen as a treasure trove of “Valley Specialties” – tropical birds found nowhere else in the US. The 797-acre Bentsen-Rio Grande Valley State Park, together with over 1,200 acres of adjoining U.S. Fish and Wildlife refuge tracts, promises year-round nature adventures in the richest birding area north of the Mexican border. Santa Ana National Wildlife Refuge ~ Located at a crossroads of biodiversity, it is home to species such as Green Jays, Common Pauraques, Plain Chachalacas and Great Kiskadees, which reach the northern limit of their range in this area. At the same time, the refuge is important habitat for birds from the Central and Mississippi flyways that funnel through the area on their way to and from Central and South America. Day 5 (Wed, Jan 23) ~ We’ll start our day birding at Estero Llano Grande State Park followed by some of Hidalgo and Cameron Counties’ hotspots before looping back to Harlingen where we’ll spend the next two nights. Either tonight or tomorrow night we’ll end our day of birding at Brownsville’s parrot roost. Day 6 (Thurs, Jan 24) ~ Full day of birding at Cameron County hotspots including Laguna Atascosa National Wildlife Refuge and South Padre Island. Laguna Atascosa National Wildlife Refuge ~ On the Mexican border at the southern tip of Texas, Laguna Atascosa Refuge occupies one of North America’s most biologically diverse regions and sees an impressive 417 species of birds — a number that represents nearly half the total for the continent as a whole. Migrants skirt the Gulf to the east and the desert to the west to funnel through this Central Flyway starting point, while many of the residents are species that reach their northernmost range here along the Rio Grande. South Padre Island Birding Center ~ Boardwalks over marshes, birding blinds, and a five-story observation tower provide visitors up-close encounters with the variety of species that inhabit the region’s wetland habitats. Permanent residents include Brown Pelican, herons, egrets, Clapper Rail, and American Alligator. Wintering species include Peregrine Falcon, Sora, Osprey, and Belted Kingfisher. Day 7 (Fri, Jan 25) ~ Morning departure from Valley International Airport (HRL). Price: $1975* per person based on double occupancy. Single supplement: $385*. Inclusions: accommodations, all meals starting with dinner on Day 1 through breakfast on Day 7, private ground transportation (Sprinter 12-passenger van), full-time driver/guide, gratuities for meals, and entrance fees. Exclusions: airfare, travel insurance, alcohol, optional activities, gratuities for your driver/guide, and items of a personal nature. Plan to arrive to Corpus Christi International Airport (CRP) by 4 pm on January 19 and depart from Valley International Airport (HRL) the morning of January 25.